FiCOM covers also selected Italian motorcycle manufacturers. The diagnostics support is in early stage of development ("early release"), do not hesitate to contact us if you run into any problems. Important notice: Aprilia uses 2 versions of 3-pin diagnostic connectors, both are mechanically compatible. If the 3-pin diagnostic connector has battery + on middle pin, NEVER use Fiat 3-pin adapter with FiCOM ! 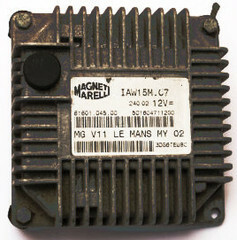 For IAW-protocol ECUs (not KWP2000) it is very important to select proper generation of IAW protocol based on ECU label and our FiCOM Ducati and Moto Guzzi diagnostics coverage.